Sonny Boy Williamson was one of the most influential harmonica players in blues history, ranking with Little Walter Jacobs as the music's major post- World War II harp stylist. Aleck "Rice" Miller, believed to be his real name, or Sonny Boy Williamson #2, as he was often called, is not to be confused with John Lee"Sonny Boy" Williamson, who, in the l930s and l940s, was an important blues harmonica player in his own right and the first to use the "Sonny Boy" nickname. Aside from being a harp player who helped set the course of modern blues, Sonny Boy Williamson #2 was also a legendary blues character whose colorful personality, unpredictable actions, and frequent stretching of the truth only served to enliven his blues with a rare, but warmly embraced, eccentricity. Williamson's harp style included intricately woven phrasing, bold sonic textures, trills and vibrato, a wide range of dynamic passion, and a superb sense of timing. He was also an effective showman-he could, for instance, put the entire harp in his mouth and still draw notes. More important, his playing made the harp the center attraction, no matter how many other great blues musicians shared the stage with him. Yet Williamson was more than just a blues harp genius and potent performer; he was also a superb tunesmith. Many of his songs-"One Way Out," "Don't Start Me Talking," "Cross My Heart," "Eyesight to the Blind," "Mighty Long Time," "Help Me," and "Nine Below Zero" are acknowledged classics and staples in any serious blues harmonica player's repertoire. Williamson was also a convincing singer and the blues' first radio star. His daily performances on the Helena, Arkansas, radio station KFFA in the 1 940s, which were heard throughout eastern Arkansas, western Tennessee, and the Mississippi Delta, not only made him a celebrity but also influenced an entire generation of blues musicians living in the region. Elements of Williamson's harmonica style can be heard in the styles of everyone from Howlin' Wolf, whom Williamson personally tutored, to Muddy Waters and Junior Wells and virtually all of the postwar Memphis blues school. Despite his status, Williamson was an odd, elusive character. Worked into his wiry frame he stood over six feet tall was a complex web of personality traits that even his best friends found difficult to understand. He was a hothead who rarely turned from a fight. He was also a shrewd talker, a drinker, a liar, a loner, a gambler, a con man, and a ladies' man. To the end of his life he swore he was "the real Sonny Boy Williamson," though, in fact, John Lee Williamson had used the "Sonny Boy" tag years before Miller had adopted it as his own. Because of his reluctance to talk about his early years when interviewed and his liberal interpretation of the truth when he did, Williamson's early biography remains muddy. Blues historians are reasonably certain he was born in 1910, although the years 1894, 1897, 1899, 1908, and 1909 have also been cited. 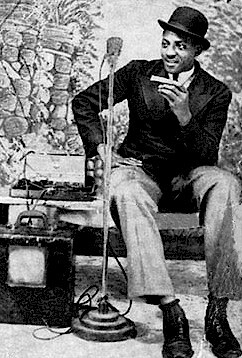 Born and raised in Mississippi to sharecropping parents, Williamson taught himself how to play the harmonica and started performing in local jukes in the mid-1920s. By 1930 or so, Williamson began his wanderings through the South, playing in parks, on street corners, in lumber and levee camps, and at house parties and juke joints, occasionally in the company of other bluesmen such as Robert Lockwood, Jr., Robert Johnson, Elmore James, and Howlin' Wolf. Although he was known in Delta blues circles thanks to his near-constant ramblings, it wasn't until Williamson and guitarist Lockwood began performing each day at noon on KFFA in 1941 that Williamson's reputation began to broaden. Called "King Biscuit Flour Time," the fifteen-minute radio program was sponsored by the Interstate Grocery Company and in its early days featured Williamson on harmonica and vocals and Lockwood on twelve-string guitar. In addition to playing a few blues numbers, Williamson chatted on the air and pushed King Biscuit flour. Although he was paid little for his services, Williamson was permitted to announce where he would be playing that evening. The advance advertising resulted in better pay from club owners and better tips than Williamson had received before becoming a radio personality. Williamson and Lockwood were called the King Biscuit Entertainers and often did station-sponsored events off the air. Eventually the duo expanded into a full, though loosely organized, band with the addition of Peck Curtis on drums and vocals, Dudlow Taylor on piano, and later pianists Pinetop Perkins and Willie Love and guitarist Houston Stackhouse depending on who was available at the time. By the time he left the station in 1944 to go back on the road, Sonny Boy Williamson, the moniker Miller had begun using around the time he first performed on the air, had become a familiar name in many Southern black house- holds. His face was even printed on the bags of King Biscuit corn meal to help sell the product. After 1944 Williamson was no longer a daily personality on KFFA. Yet whenever he returned to Helena, which was often, he went back to the station and resumed his role as on-the-air performer and entertainer. Throughout the rest of the decade, Williamson performed in the Delta with guitarists Elmore James and Joe Willie Wilkins, pianist Willie Love, and drummer Willie Nix. Despite his blues credentials and popularity, Williamson didn't begin his recording career until 1951 when he cut sides for Trumpet, the Jackson, Mississippi, label. Williamson's now-classic Trumpet tracks are raw and rough, especially when compared to his later recordings with Chess. Yet their coarse juke-joint swagger and brilliant harp work reveal much about Williamson's blues view and early performance style. Williamson was based in the Memphis area until 1954 when he moved first to Detroit and then to Milwaukee and Cleveland. But he never severed his Southern roots, regularly returning to perform right to the very end of his career. After Trumpet had suspended operations in 1955, Williamson signed on with Checker, the Chess subsidiary label, with whom he recorded until the early '60s. Cutting sides with Chess session musicians like guitarists Lockwood and Luther Tucker, pianists Otis Spann and Lafayette Leake, bass player Willie Dixon, and drummer Fred Below, Williamson's sound became more tightly defined and assumed a greater sophistication than on the Trumpet sides. Williamson continued to tour, working his way through St. Louis, Memphis, Helena, and the Delta, then back again to Chicago. In 1963 and 1964 he toured Europe as part of the American Folk Blues Festival package. He also performed and recorded with British blues-rock groups the Animals and the Yardbirds (with Eric Clapton on guitar), becoming as big a blues star in England as he was in the States. Unfortunately, by this time Williamson's health had begun to deteriorate rapidly. In 1965 he returned to Helena and resumed, yet again, his appearances on KFFA' s "King Biscuit Time." Shortly thereafter, he died. Williamson was inducted into the Blues Foundation' s Hall of Fame in 1980.